As things stand right now, the Mets currently have Yoenis Cespedes, Curtis Granderson, Jay Bruce, Michael Conforto, Juan Lagares and Brandon Nimmo in the outfield mix for next year. One thing’s for sure. Nimmo is not in consideration for a starting spot, nor should he be, and it seems likely that one of either Jay Bruce or Curtis Granderson is dealt this winter (both with one year left on their deals). While people debate which is the one to be traded, we can’t forget the importance of building toward the future. 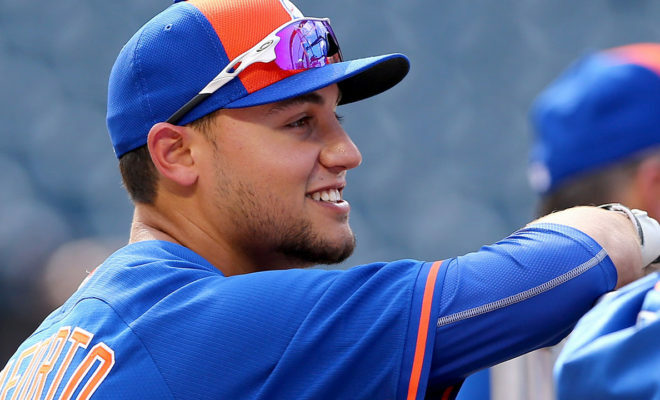 A lot of that rests on the shoulders of Michael Conforto, who despite his struggles in 2016, deserves a shot to be the everyday right fielder next season. Here’s how I would let it shake out. While Cespedes did an adequate job in centerfield, he’s a left fielder. Let’s leave him there and let his bat do the talking. As for center, a healthier Juan Lagares, along with Granderson against righties, would be a fine platoon, leaving right field for Conforto. As for backups, I think Nimmo has done enough to earn a look, and there’s been talk of Jose Reyes and T.J. Rivera taking reps so they can continue their super utility roles. With these guys, a lot depends on the health of the infielders. David Wright has Spinal Stenosis, and Neil Walker is recovering from back surgery. Asdrubal Cabrera is no spring chicken, and Lucas Duda was out for a large portion of the season as well. So Flores and Rivera are important in a backup sense for the infield as well. The other thing to note is Rivera or Nimmo may have to stay in Triple-A for a bit due to the lack of available spots on the bench. Either way, things are looking good, and it’s time to start exploring options for the bullpen. Bruce could probably get us at least one arm, plus a prospect, and I’d expect the return for Granderson to be similar. If you’re asking me, I would rather keep Granderson. With their contracts being negligible, Granderson provides good fundies (as Keith Hernandez would say) and he just has an all-around winning attitude. Now that I have gone on a tangent, here’s how I see the 25-man roster shaking out, if the season began tomorrow, assuming that Jay Bruce is traded and Jeurys Familia is suspended.